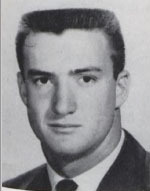 Tiger fans had to endure a rebuilding year in 1960 after the loss of 20 seniors who had led LSU to a 20-2 record their last two seasons, including the national champ­ionship in 1958. 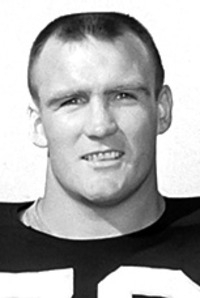 The departures included the three backfield stars - Heisman Trophy winner Billy Cannon, QB Warren Rabb, and HB Johnny Robinson. 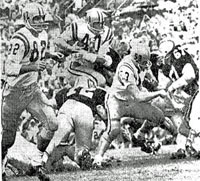 1960's young Tigers with 18 sophomores in the first 33 tied three-TD-favorite Ole Miss in Oxford, then won their last four games to finish with a 5-4-1 record. It wasn't good enough to get to a bowl game but nevertheless boded well for the future. The defense gave up only 50 points in ten games, but the offense averaged just 10.5 ppg despite scoring 35 in the rout of South Carolina. 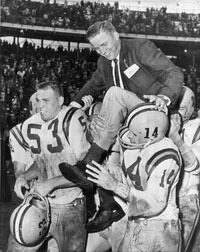 LSU was ranked #5 in the Associated Press 1961 preseason poll. And who could quarrel with the voters when Coach Paul Dietzel returned 24 starters from his famous three-unit combo of the White team, Go team, and Chinese Bandits? But the season didn't start well at all. 73,000 fans in Houston saw Rice defeat the Tigers 16-3. 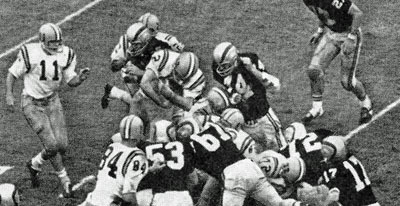 In the home opener the following week, LSU trailed 7-2 in Q4 before HB Wendell Harris tightroped down the sideline for the go-ahead score. Georgia Tech came to town ranked #3 but returned home a 10-0 loser. Coach Bobby Dodd said, "In all my career, I've never seen a team better prepared to stop us. The pass rush and coverage was the best I've ever seen." The Tigers took care of business in their remaining three games, although Mississip­pi State scared LSU fans. Trailing 7-6, the Maroons were driving for a possible game-winning TD or FG when senior FB-LB Earl Gros intercepted a pass, then burst up the middle on the next play to the 2 before scoring the clinching TD. The next day, the players voted to accept an invitation to play in the Orange Bowl against the Big 8 Conference champion. Dietzel claimed there was an understanding that the LSU-Ole Miss winner would get a bid from the Cotton Bowl because the bowl had already unofficially invited the Rebels. Supposedly the Dallas officials backed off when the Tigers upset the Rebels. As it turned out, Ole Miss went to the Cotton Bowl anyway to play Texas. LSU ended the season with another rout of Tulane. Amazingly, the score was the same as in 1958 in New Orleans: 62-0. The Tigers ended the regular season #4 in the AP poll. Colorado defeated all seven of its conference opponents to earn the school's first conference championship and the trip to Miami for its third bowl appearance. 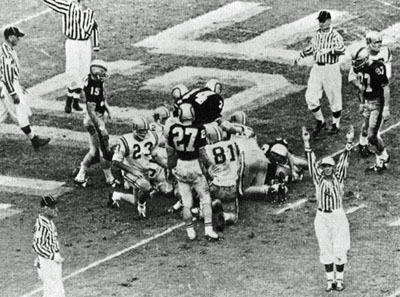 The biggest victories came back-to-back over 1959 champion Oklahoma and 1960 winner Missouri. 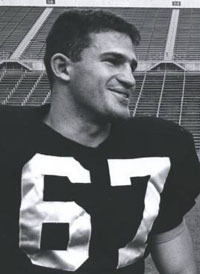 31-year-old Everett "Sonny" Grandelius had been an All-American HB at Michigan State. 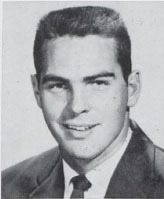 He later served as an assistant there to Duffy Daugherty. 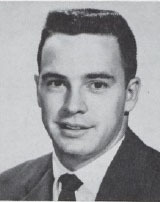 During Sonny's three years at the helm in Boulder, the Buffaloes had improved from 5-5 to 6-4 to 9-1. The Buffs had entered the AP Top Ten in Week 4 and moved as high as #6 before finishing #7. As LSU began preparations to meet Colorado in Miami New Year's Day, an event 1,400 miles away from Baton Rouge would change Tiger football forever. On December 9, Army dismissed head football coach Dale Hall, who com­piled a 16-11-2 record in three years. Following the legendary Earl Blaik, who went 121-33-10 in 18 season, Hall's record wasn't good enough, especially since he was 0-3 vs Navy. The an­nouncement of the firing stated that Hall would be replaced by "the finest coach available." That implied that West Point would break with its tradi­tion of restricting the coaching post to academy graduates. 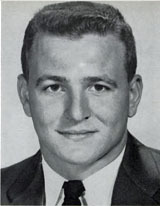 That opened the door for potential candidates who served as assistants at Army during Blaik's tenure, including Dietzel, who coached at West Point in 1953-54. When asked two days later whether he was interested in the West Point job, Dietzel told reporters, "I am very happy here and plan no change." However, as Paul revealed in his autobiography, he had in fact been con­tacted by the Academy athletic director, who wanted to know if he were interested in the job. Dietzel then reported the contact to LSU AD Jim Corbett and asked if getting out of his contract would be a problem. Jim replied (according to Dietzel), "If you want to go, there's no way we would want you to stay. It wouldn't be good for either of us." Meanwhile, the Tigers returned to the practice field December 11 for 12 days of drills before leaving for Miami December 26. In addition to outdoor sessions with lots of running but a minimum of contact work, the team watched Colorado game films. Trying to keep his team from peaking too soon, Dietzel cancelled the last two days of workouts after they looked sharp the day before. The LSU Board of Supervisors met December 15 and approved paying Dietzel and his staff a bonus of 10% of their salaries for their work preparing the squad for the Orange Bowl. Once in Florida, the Tigers followed the same routine at the University of Miami that they used all season the week of each game. The main diffe­rence for Dietzel was fending off the constant questions about the Army job as national articles listed him as one of the top three candidates for the vacancy. "My one thought is to get ready for the Colorado job," he insisted, "and that's all I'm worried about." With the NFL and the new American Football League vying to draft and sign college players, Dietzel warned his seven seniors not to sign a pro­fessional contract prior to the bowl game. He also promised to assist them afterward in negotiating the best possible contract with either league. Coach Grandelius portrayed his team as the poor country boys against the rich city slickers. He didn't fear LSU's three-platoon system. "We just don't have that many football players. ... I know LSU has a great football team, and it must be wonderful to be able to send three teams in the game, but as long as the referee doesn't let them use all three teams at once, we'll be all right." Colorado's second team didn't play as a unit. Instead, the Buffs made individual substitutions as the situation required. Would the Big Eight champs stay in the 4-5 defense they preferred to stop running plays or adapt to handle LSU's passing attack? Sonny seemed irritated when asked whether the heat in Miami would bother his team. His team had played in Miami during the season, beating the Hurricanes 9-7. 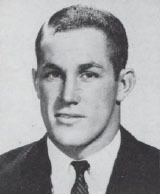 Colorado's two All-Americans, G Joe Romig and E Jerry Hillebrand, both said the heat and humidity had bothered them in the second half. Reporters pointed out that Miami's star QB George Mira missed the game against Colorado. Sonny explained: "I don't coach football for rain, snow, sleet, or heat. I coach my team to play football whatever the conditions. Those things bother you only if you let them bother you. ... Several of our key boys have gone 58 or 60 minutes in several games ... 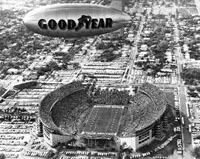 I wouldn't be afraid to play my entire starting team 60 minutes against LSU ..."
To get acclimated to the climate, the Buffs would fly to Miami December 23 - the earliest any Orange Bowl had ever come to the city. Grandelius explained his strategic approach to the game. "We'll probably put in a few new wrinkles and maybe a couple of new plays, but we won't change our basic offense, and I certainly don't expect LSU to do that either." The offense was well-balanced - 1,919y on the ground compared to 1,182 through the air. In keeping with their nickname, the Buffaloes would field the bigger team. 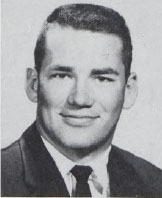 Tackles John Denvir and Jim Perkins weighed 235. Romig was the smallest lineman at 195. All four starting backs tipped the scales at no less than 190 pounds. When asked about the size of his players, Dietzel responded, "We could have big men if we let them get fat." 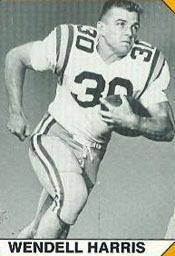 LSU had one of the pioneering weight-training programs in college football. Grandelius took the opposite approach from LSU's. He held a 90-minute scrimmage for his squad Christmas Day in Miami and continued contact work all week. "We played one of our best games of the year the week we scrim­maged on Monday, Tuesday, and Wednesday. We beat Iowa State 34-0." Dietzel summarized the task his Tigers faced like this: "The pros have drafted seven off this team, and those boys don't make too many mistakes. It must mean they have good personnel. ... Although the Big Eight confer­ence might not stack up as a whole with the Southeastern, I think the champion would be good enough to beat anyone." The LSU coach called Colorado the best punt returning team he had seen. 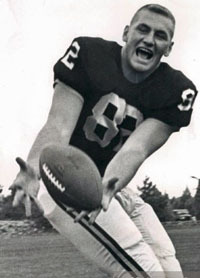 The Buffs returned 35 punts for 551y, thanks primarily to HB Ted Woods, the NCAA 400 meter champion and a 1960 Olympian. The Dietzel Departure story gained momentum as the game approached. 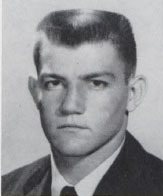 Two days before the game, a New Orleans TV station and two newspapers there reported that Dietzel would sign a contract with USMA that would pay him $20,000 a year, a raise of $1,500 over his LSU salary. Reporters noted that Dietzel no longer denied the reports as he had been quick to do several weeks earlier. AD Corbett said, "I am apprised of the situation. I have talked with Army officials, and I have talked with Coach Dietzel about it, but that's as far as it goes. As far as I am concerned, Dietzel is coach at LSU until such time as I am advised differently." Jim added, "I think the LSU coaching job is one of the finest in the business." The Tigers were favored by as many as 17 points by some oddsmakers. The game was billed as a classic matchup of Speed vs. Power. The headline over the January 1 article on the game in the Chicago Daily News proclaimed, "THREE L.S.U. SQUADS FACE 1 OF COLORADO." The burning question was whether the incessant talk of Dietzel going to Army would prove to be a distraction for his players. The game time temperature was 67° with 90% relative humidity. How would the Buffaloes hold up in the balmy conditions? 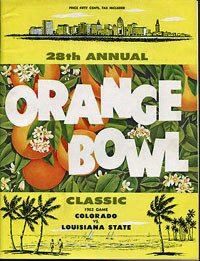 ABC telecast the 28th annual Orange Bowl with Curt Gowdy calling the action and Paul Christman providing commentary. Two teams from far away failed to fill the Orange Bowl. Attendance was announced as 68,150. Spectators needed raincoats and umbrellas as the game was played in a steady drizzle - supposedly a first for an Orange Bowl game. 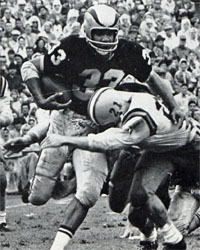 Earl Gros breaks through the line. The Go Team came out to receive the free kick, which QB Lynn Amedee caught on a fair catch at the LSU 45. Dietzel's offensive specialists started strong, ripping off two first downs to the 34. Ray Wilkins' 8y sweep and Amedee's pass to HB Bo Campbell for 8 were the key gains. But Ken Blair and Joe Romig sacked Lynn on 3rd-and-6 at the 39. So Stovall came in and punted dead on the 18. 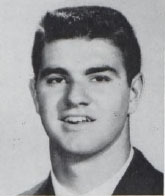 Larry Mavity, whose participation had been doubtful because of an injury in the final regular season game, tried LE, but Field dumped him for a 6y loss. Earl Gros blocks for Wendell Harris. Blair dropped Weidner's 2nd-down pass before Harris gained only 2 at RT. McBride got off his punt this time, LSU's Harris signaling for a fair catch at the CU 47. Cranford scoresLSU's first touchdown to retake the lead. Starting from their 20, the Buffaloes gained three first downs. The first two came on passes, Weidner connecting with Hillebrand for 17 and Mavity for 9. Mavity then knifed through RG for 11 to the LSU 38. But the Bandits, with some White team players mixed in, drew the line there, aided by an illegal procedure penalty. When Mike Morgan broke up Weidner's 3rd-and-3 pass to Hillebrand, McBride punted into the EZ. The Tigers then went three-and-out. To make matters worse, LSU was penalized for a personal foul on the punt return to set up the Buffs at the Tiger 44. But the defense ended any CU momentum before it started. Two incomplete passes and a Fred Miller stop of a run for no gain set up a FG try by Hillebrand from the 44 that fell short. The White team drove from the 20 to the 45 to run out the clock. The Buffaloes needed to take the kickoff and, using any adjustments made at halftime, get their offense clicking. Starting from the 20, Weidner threw two passes. The first was broken up by Harris, and Hillebrand dropped the second. Then McBride barely got off a punt that traveled only 18y to the CU 43. Jimmy Field plunges into EZ. Giving up on running the ball, Weidner threw three straight passes, com­pleting just one of them to Schweninger for 4y. So LSU started from their 32 after the punt. The only way the Buffs could get back in the game was to get turnovers. 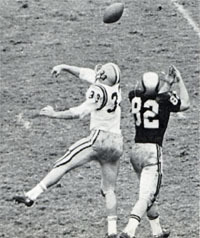 And they got one when Claude Crabb snagged Amedee's long pass at the CU 40. But they couldn't capitalize. On 4th and less than a yard, Grandelius gave the signal to go for it. But Woods fumbled, and Sammy Odom recov­ered for LSU at the CU 49. Amedee's completions to Campbell for 18 and Wilkins for 8 led a Go Team drive that reached the 19. But a holding penalty (15y in those days) forced the Tigers to go to the air. Three straight incompletions led to Stovall's beautiful punt that went out of bounds on the 5. LB Roy Winston dumped Mavity for a 3y loss. Then Weidner found RB Ed Coleman for 7. Stovall made a fine recovery to knock down the 3rd down long pass to bring McBride back for his second punt from the end zone in the game. It was hard to imagine it could be any worse that the first one, which led to a safety, but it was. 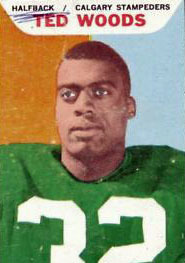 Gene Sykes blocked the kick and fell on the ball in the EZ. 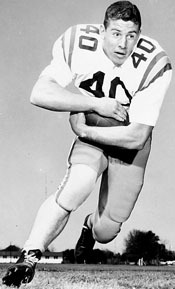 Harris's PAT gave him 99 points for the season, one more than Steve Van Buren scored in 1943 in the only other season when the Tigers went to the Orange Bowl. Coach Dietzel praised Sykes after the game: "Gene Sykes has been playing great football for us. He weighs only 183 pounds, but he's been the best end we've had since I've been here." Woods returned Harris's kickoff 27y to the 19. With the issue no longer in doubt, Weidner had no choice but to pass. But he overthrew Mavity, then threw into Wendell Harris's area twice to no avail. Harris would play six years as a DB in the NFL. The Tigers gave the ball right back, Woods recovering Gros' fumble at the CU 42. Weidner took advantage of the second chance to penetrate the LSU 35 for the first time all day. With plenty of time to throw, he sent Hillebrand across the middle for receptions of 13, then 12. After running a draw to slow the rush, Gale threw twice to E John Meadows cutting across the middle to put the pigskin on the 11. But his next two aerials were overthrown, then an offside penalty set CU back. Going for it on 4th, Weidner went to his best receiver, Hillebrand, but Field broke it up. 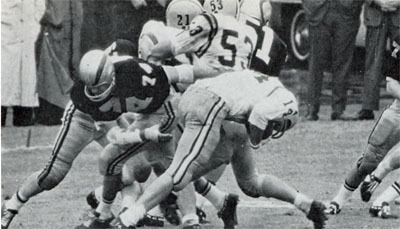 L: Fields defends against Woods. From the 16, the Go Team ate up more clock, gaining three first downs on 11 runs and an Amedee completion to Campbell for 12. Finally, from the CU 30, Lynn was again bitten by the INT bug. Bill Harris got his second pick. But more errant throws forced McBride to boot. The LSU possession started with a holding penalty. Two runs and an incom­pletion led to Stovall's punt to the CU 33. Grandelius sent in his backup QB, Frank Montera. He completed his first pass but missed on the next two. 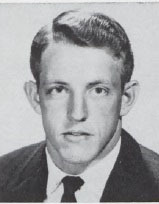 McBride came in to punt, but the snap went to Weidner, who connected with Hillebrand for 11y and a first down at the LSU 49. Gale stayed in but could complete only one more pass, and that one went to T John Denvir after hitting a receiver and bouncing into the air. Colorado's 39 pass attempts set an Orange Bowl record. Tommy Neck got a carry for no gain as time expired. Jerry Stovall tackles Ted Wood. Tigers carry Dietzel off the field. Dietzel: "I didn't think they could run on us, but they could throw the ball real well. We didn't lay our hands on Weidner all day. He is a real good passer and had fine protection. I don't believe we were nearly as sharp today as we were during the season. We weren't spectac­ular ... but we got the job done. And the boys really enjoyed themselves on the trip. A loss would have spoiled the fun." On the topic on everyone's mind: " Concerning my moving to Army, I put it out of my mind until the Orange Bowl game was over. I'll now give it my full consideration. ... I have no fur­ther comment." Lynn Amedee: "They are built like pros. I've never seen a team so big. Our FBs were blocking real well to help our outside stuff." G Monk Guillot: "Boy, they were big and tough. I believe that's the hardest I've been hit." 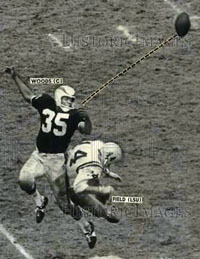 Gary Kinchen: "I believe McBride fumbled the ball when I blocked it. We got through there every time and should have blocked more." 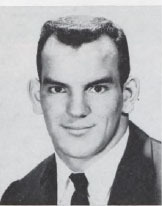 LB Steve Ward: "Those big ends could really catch the ball - Hillebrand and Meadows - and they gave us fits." Charles Cranford: "There was some good blocking ahead of me for my TD run. It was wide open when I went through." Jimmy Field: "I gave 'em a really cheap TD. I knew we would have to score again in the second half but felt we could - and could hold them." Roy Winston: "I thought they had a big, tough line. I believe their line was just as good as any SEC line although they weren't as fast and didn't have the depth." Grandelius: "We picked the wrong day to make all our mistakes. LSU is a fine football team. I can't take anything away from them. They did a fine job on that rollout pass and run. Our LBs were just not quick enough to stop them. ... We didn't have bad protection on our punts. The LSU linemen were just getting in there. We hadn't come close to having a punt blocked all season. ... Their three teams didn't wear us down. We just made too man mistakes. We didn't play as good football as we had during the year." 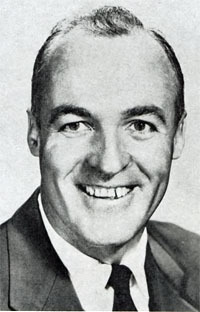 Neither head coach returned for the 1962 season. Colorado fired Grandelius in March because of charges that he had used a slush fund to pay top recruits and their families. Even though an NCAA investigation released inconclusive findings, Colorado was banned from TV appearances and bowl games for two years and 20 players lost their scholarships. 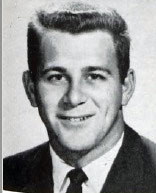 Grandelius spent the rest of his coaching career in the NFL. On January 5, the LSU Board of Supervisors met and released Dietzel from his contract obligations and authorized AD Corbett to negotiate for a new coach. Jim hired defensive assistant Charlie McClendon, who was being wooed by his alma mater, Kentucky. Dietzel flew to New York and signed a contract with Army January 6.